For longer than I can remember I’ve been fascinated with cloisonné pins. There is just something about them that makes me smile. I’ve been collecting them for a long time, from Disney parks, zoos and aquariums and many other sources. Eventually I had to make rules to limit my collecting. Like most hobbies it can begin to take over after a while. As an artist I thought that designing pins would be fun. I designed and helped produce a few pins back when I worked for MU Press and even thought about starting a pin company. There were too many aspects of running a business that just did not appeal to me so I let it drop. One of the places I like to get pins is the Hard Rock Café. I got my first HRC guitar pin in Paris in 1992. Since then I have been to HRCs in Yokohama, Cancun, Puerto Vallarta and many US cities as well. When one opened up in Seattle, I was thrilled. I am by no means a completist, but I go in every other month and buy a pin and trade with the staff. The trading is very fun and I always look forward to it. One day when we were in, I mentioned to the retail manager that I thought it would be great to have an HRC pin commemorating our steampunk convention, Steamcon. I knew that Dragoncon and Wondercon had done HRC pins and even the local Emerald City Comic Con had one. She said it would take some doing and a lot of lead time, but it was possible. I submitted a design, found a charity to benefit; the Historic Seattle Preservation Foundation and by Steamcon III we had an HRC pin. As a pin aficionado I was quite proud. By this point they had begun a Seattle HRC pin collector’s meetup every quarter or so. I met some great folks and we traded and chatted. They were extremely supportive of my Steamcon pin designs and commented on how different they were. It was encouraging. The retail manager decided to ask us fans what sort of pins we would like to see. You could just write out a description or you could add a sketch. There was no compensation or credit offered, but it was still pretty cool. 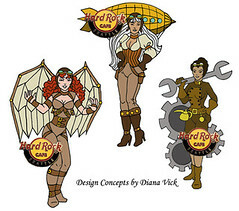 I submitted a set of six steampunk girls that I had been working on and a couple other sets as well. When I was in Orlando, a manager there told me that corporate had decided all pins now had to have a musical component. 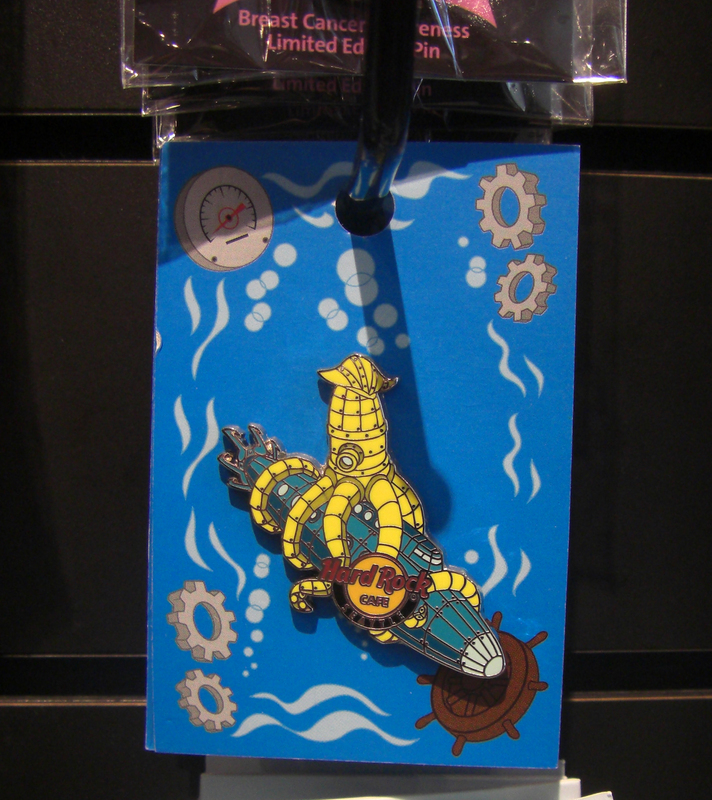 This complicated things a bit, but in the case of the Steamcon III pin, they added musical notes to the tail of the submarine. On Steamcon IV’s mechanical bat, I didn’t see any changes at all. When I submitted the steampunk girls I did not add any music, so I didn’t know if that meant they wouldn’t take them at all. We weren’t told it was a requirement. I did also do a set that is an anthropomorphic animal band, so I am hopeful that it will be produced. Yesterday one of the pin collectors said that he heard that a set of three steampunk girls were coming out soon, but he didn’t know if they were my designs. I then got an email from HRC asking if I had a preference about when they got released. I said right away was good for me. So, yes, they were mine! Yay! I still did not know which ones or what changes had been made. My husband and I went to HRC Seattle the next night and sure enough, there they were. They did add musical instruments and changed things, but for the most part I am pretty happy. The staff was enthusiastic and supportive. It feels great to be able to say “I designed those!” A dream come true in a way. Now to figure out how to design a Disney pin. I am really not expecting that one to happen, but a girl can dream. 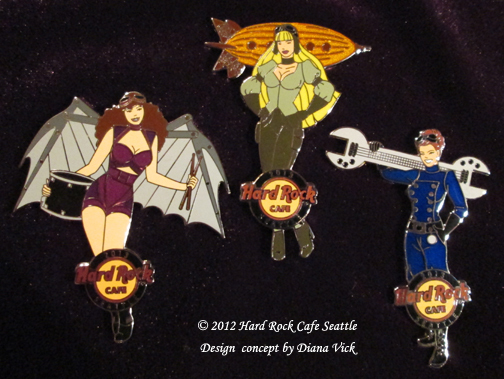 For anyone interested, the pins are currently available at the Hard Rock Café Seattle. They are $12.00 each and are limited editions of 300.